The ceremony has been adopted in Island Bay by its Italian community since 1933, when the fishing boat Santina foundered in Cook Strait, with the loss of four crew including three Italians. 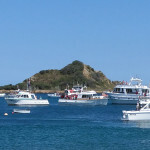 The “Blessing of the Boats” attracts large crowds to the coastline, who come to watch boats from all over Wellington be put through their paces and blessed for safe carriage and bountiful catches. Unique to Island Bay, local and visiting Clergy venture out into the Bay to bless the fishing boats after they’ve made a trip around Tapu te Ranga Island. So many boats and so much activity really makes this something special to see.